Biologists with the Virginia Department of Game and Inland Fisheries will band the Richmond peregrine falcon chicks this Thursday May 17th. Biologists will access the ledge and retrieve the chicks who will be weighed, measured and fitted with two bands. The first band is green aluminum and has a unique 9 digit numerical code. A second green and black band has letters and numbers large enough to read with binoculars or telescope. This auxiliary band is meant to assist with identifying birds in the field without having to capture them. While the banding is being performed a pen will also be erected at the nest box. There is a history of premature or accidental fledging at this nest. The pen ensures that the young birds have plenty of time to develop before taking their first flight. The door is opened remotely on the release date and ensures that VDGIF is able to position staff and volunteers on the ground the day the birds fledge to provide assistance if any of the young birds run into trouble. Check out the blog archive for video footage of chick banding and the chicks exercising in the pen. These three chicks are doing well and by all indications are very well fed. 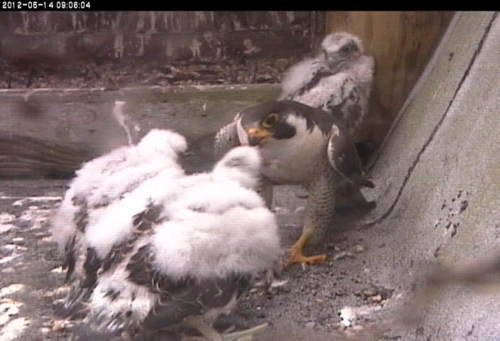 They are standing on their feet for extended periods of time and moving around the ledge near the nest box.